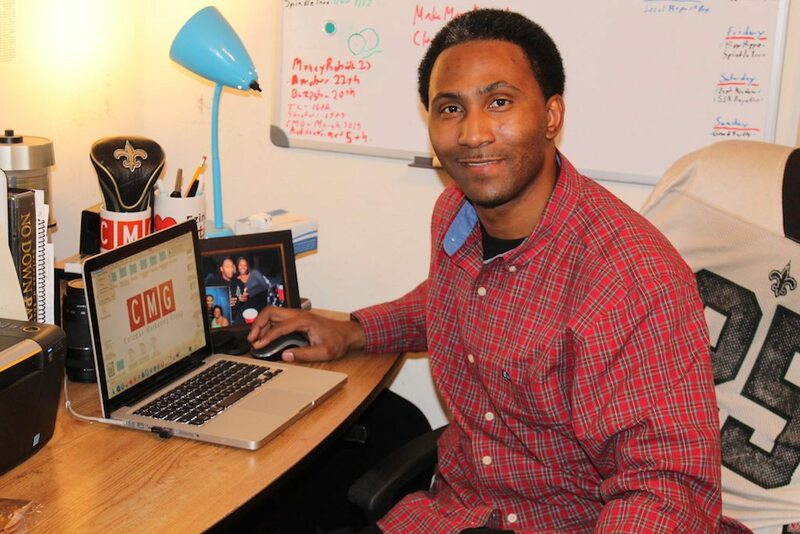 Antonio Coleman is CEO of the Coleman Marketing Group. Describe what you do in one sentence: I put my clients’ businesses in front of their targeted audience by using creative online marketing. Well, what I love to do more than anything is spend time with my 13- and 11-year-old daughter and son. They are very active in sports, so I’m always coaching them and their teams if I have the time to volunteer. Overall, I love this maybe more knowing that I’m helping them to become better people in society. What’s your favorite classic piece of literature and why? “Rich Dad Poor Dad.” That book has changed my life ever since I read it for the first time years ago. Robert put together something that has not only helped my life but millions of others. Even today, I have the audio versions of it and listen to it all of the time when traveling or working out. Just those words coming from his “rich dad” still to this day light a fire underneath me to keep pushing forward. Plus, I would like to add the book “The Millionaire Next Door” — now, this is a really old book on showing how to live conservatively and still get the most out of life. If you haven’t read it, I suggest that you check it out. Are you the first entrepreneur in your family? Yes. At least, I can say I’m the first to actively take my dreams from a thought to reality. My family is the best in world (if you ask me) due to the fact they are all 100 percent supportive of my goals. Even though I’m the first, I’m definitely not the last because my daughter is showing some signs of entrepreneurship. Why’d you decide to join your company? I wanted to fill that need in society to help people who are willing to grow their business with creative marketing. What I wanted to do is educate people in a manner that suits them the best. Helping people is something that I get the most joy out of more than anything in this world. Seeing the smiles of those whom I help is what makes all of this worth it. Describe a time when you felt particularly insecure about the future of your company. How did you bounce back? I would say back in 2009 when my business got turned upside down from my own actions. I lost a lot of my business back then only due to the fact that I put all of my eggs into one basket. It took me some years to rebound from that major downfall, but once I did, it’s pretty much been smooth sailing ever since. All I did was restructure the way that I marketed and presented my company online and offline. Now, since changing a few things here and there, I’m able to really feel 100 percent confident about the future of my company. What would you describe as your company’s biggest victory since you joined it? That victory can be summed up in just being able to continue to work with highly professional people. Without this victory I wouldn’t be able to carry on my business as effectively as I do. Honestly, in the game of marketing, there are never any victories, really, because everyday seems like a game that never ends. I will say that it’s a blessing to be doing something that I love to do and be able to share my experience with those who need it. Just that alone is a victory for me and business owners who seek out my expertise. What’s been the biggest obstacle your business has encountered, and how have you dealt with it? This is somewhat of a touchy subject, but I’m not going to overlook it like it’s not there. You see, being a minority in this world of marketing, it can be a little difficult for people to trust you. This is something that I’ve had to endure for a number of years, from bad emails to horrible comments on my site. This is just the reality of doing business on any level: You will come across people who don’t care too much for you. The way I deal with it is by just being myself and showing people that I know what it takes to market their business. Give everyone the tools they need to succeed, and hope that’s enough to change the notion of how people view me. What puzzles you most about the industry? how little people know about local online marketing. It puzzles me, but I feel like I’m the one guy on this planet who can come into this space and educate people on the correct manner of how to get those real estate leads. This is something that bothers me a lot, but I’m very confident that with a little educating I can start a change in this industry. What is the most important lesson you’ve learned about building a business? One of the biggest lessons that I have learned over the years about building any sort of business, no matter if it’s online or offline, is that you must stay consistent. This is the key to success. You must know what works and how to keep pushing that task or action so that you can reap the benefits. I see so many people running from marketing company to marketing company thinking the poor services are the reasons why they’re not being successful. What I’ve learned is that if you have a business and you want to take it to the next level you must make a sacrifice to continue to educate yourself. Just know that this will be a long ride, so be patient if you really truly want to see success in the long run. I stress this over and over to business owners every day: Be patient and keep being consistent. What’s the most overrated real estate technology? Wow, this is a hard one for me because I started in real estate back in the early 2000s so I’ve had the chance to see the evolution of the industry just from the marketing standpoint. What I say is that the most overrated technology for me as of today, from talking to hundreds of Realtors, investors and brokers, is the lack of knowledge of using so-called squeeze pages. I’m not a big fan of squeeze pages on your real estate website. It’s not professional, if you ask me, and it doesn’t serve a big purpose. I see so many real estate people using them, and I just cringe when I come across them knowing that they’re not used in the right manner. If you want to capture leads on your real estate website, don’t ask for their information upfront. Always educate your potential lead, and then allow them the opportunity to give you their information. It’s not smart marketing to ask for that upfront without building some sort of a relationship with them first. This is a part of the new real estate technology I think is hurting tons of real estate people across the world, and they have to make an adjustment if they want to really take their business to an all-new level. How will the role of the real estate agent change over the next five years? Personally, I think starting now, real estate agents need to start becoming more of an educator versus a salesman. I know that you as a real estate agent need be more of a person who will be willing to sit down and talk about the options. If agents can take the role of educators versus just showing properties or listing them and crossing their fingers hoping that it sells, then they will start to see more success. I’m looking to transform the old-school real estate agent who just knows how to close deals to the agent who is up to-date on marketing, online and offline. The Realtor who has the knowledge to provide the best service possible to their clients has that knowledge due to the fact that they’re being educated themselves. Unfortunately, I come across so many agents who have not a clue on how to grow their client base. Hopefully, through a lot of hard work on my part and the community here at Inman, we can start a new trend of agents who are all willing and ready to learn. What motivates you more: power or money? Has to be power. Not in the light of having to control something but more in the manner of knowing I can achieve something no matter the obstacle. Power gives you options that sometimes money doesn’t provide for you. So if I had to choose one, it would be power over money any day of week. What is your biggest professional fear? You see, I know that if I get that turning feeling in my stomach, then I know that this is something that I need to be doing. Fear is a good thing for everyone, but who embraces it and tackles those fears are the ones who reap the benefits of it. So I would say public specking is my biggest fear, but I’m ready to tackle it with open arms this year. What is your biggest personal fear? One of the biggest personal fears I have today is just having enough time in the day for family. Running any business can take away a lot of time from those you love until you reach a certain level. Managing my time is something that I stress about a lot but I seem to have gotten a little better at doing it. That is something we all must do is not only give 110 percent into our companies, but making sure we take out time to spend with family. Yes, we sometimes have to sacrifice a lot of time on new projects or clients, but knowing the middle ground is what will allow you to have the best of both worlds. Whom do you respect most in the industry? I respect Brandon and Joshua from BiggerPockets.com. Their website is strictly for those who are into the real estate industry and looking for a place to learn. I’ve met some many great people from their real estate website that gave me the chance to pass on my knowledge to them. This is all from the platform that they have created, which is giving the average real estate investor all of the tools that they need to succeed. This is something that you don’t see every day online, so my respect for both of them is extremely high. Are you a leader in the real estate industry who’d like to participate in our profile series? Email amber@inman.com.